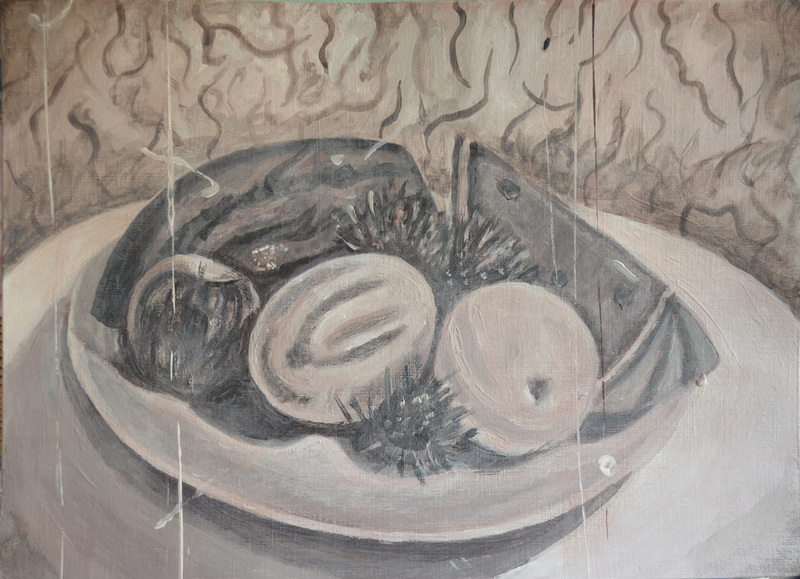 For this exercise paint your still life in any way that you choose. 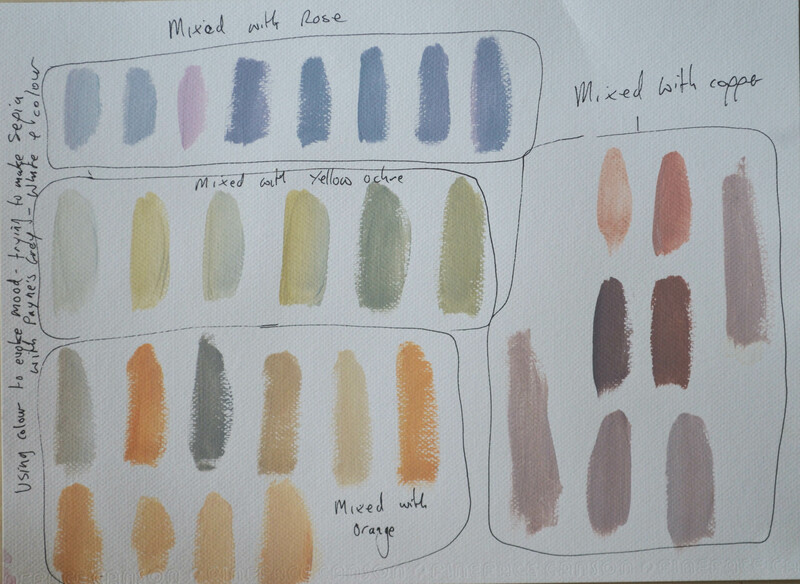 Make decisions an advance about the range of colours that you will use. You are aiming to create a mood or atmosphere in your use of colour and handling paint. The idea for this exercise started with the last study in complimentary colours. Experimenting with the background made the painting look quite creepy and looking at it I couldn’t help thinking of a Tim Burton movies so with that in mind I tried to build on that for this exercise hoping to evoke a sinister mood to the painting. For some reason I couldn’t imagine this still life in any other colour but Sepia and so I edited a photo of the previous still life in Photoshop so that I could try and work out for myself, without looking on Google which colours would make Sepia. Of all the colours the copper mix looked best and so I decided to start the still life composition to see how well the colours looked together. I used the same big brush technique as in the previous exercise barring the spines of the rambutan. Eve though the three colours looked great together in my experiment they didn’t look that great on paper the Payne’s gray looked too blueish and it was obvious it needed swapping for black. I was also going through the copper at an alarming rate as it was only a small tube then I realised that the copper was very similar to Burnt Umber and so I swapped again. The finished piece looked great, you could see it was a Sepia painting but it didn’t look how I expected it to, I asked my girlfriend how she felt when she looked at it and her reply was ‘sad and cold’ these weren’t the moods I were going for but at least the painting was getting some kind of emotional reaction. At this stage I thought it wouldn’t hurt to experiment further and so I kept experimenting hoping to find the result I had been hoping for. I began by making a very thin mix of Burnt Sienna and white and applied it over the top of the painting with a scrumbling technique to try and give the painting an aged look. I then applied made a light mix and a dark mix of the same colours then run the edges of a another sheet of paper through them and and then applied the paint to the painting in very thin vertical lines to give it an old movie flicker effect then added a few more white specs and flicks with a thin detail brush. I’m not sure what mood this painting evokes but if nothing else it does look like the scene from an old movie or a cine-cam clip from an horror movie or at least I hope it does. I am satisfied with the way this painting turned out , the photo above doesn’t do it justice there is actually a lot more colour to it,. I Think that this style would really suit a portrait and so I hope to put it to use a bit later on in this course. Looking at the paintings side by side the composition is almost identical but the effects that I have created in both are completely different. In the first study, Still Life with Complimentary colours the subjects are very three dimensional but yet due to the limited palette of two complimentary colours the subjects look to have an over-exaggerated sense of form as if they are made from Plasticine, the background seems to emphasize this. In this last exercise my intention was to build on the qualities that already existed in the previous painting and to try and evoke mood by realizing what I imagined the finished painting to be like. The effects used in this new painting were very different, unlike the first study in this last study I managed to create a sense of distance, like the composition is in the background and the movie clip lines/flicker effects are in the foreground. I think going over the painting with the mix of white and burnt Sienna with the scrumbling technique I mentioned earlier to tone down the composition and then painting definite horizontal lines over the top created this distance effect. It probably doesn’t look as sinister as what I expected with the still life but I can imagine this effect would work really well with a Sepia self portrait or scary doll on a trike. 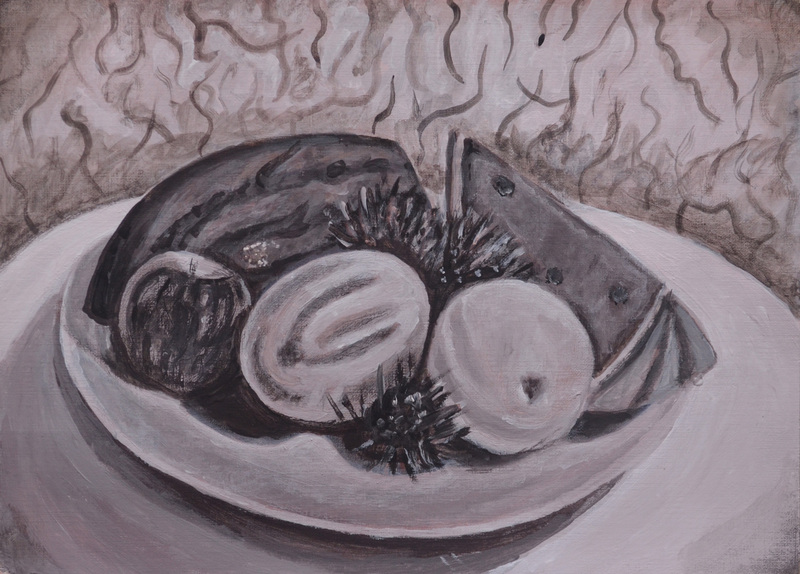 This entry was posted in Coursework, Pt 2 - Close to Home, Still Life with Colour used to Evoke Mood and tagged colour relationships, distance learning art course, oca painting 1, painting degree distance learning, sepia painting, Still Life with Colour used to Evoke Mood on June 10, 2015 by Mark A Smith. 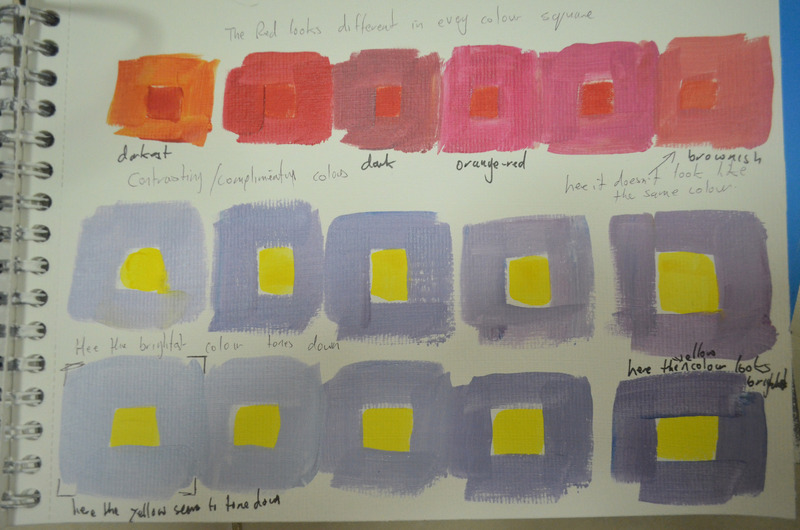 Make a colour study of your still life using only a narrow range of colours. This will require great concentration and discipline in observation and interpretation. Make the most of using colour in an inventive way. I should have probably used my Chromium green with primary red for this exercise but I decided to mix my own green from primary yellow and primary blue. Some would call that cheating as even though I did make a nice dark green out of the two colours some of the lighter tones looked blueish with others a yellowy green. I could have been a bit more inventive with the subjects I used for the still life maybe choosing subjects of all different colours and I regret not doing that instead of choosing subjects of similar colour properties like I did but I still feel satisfied with the end result. This was the first time using small sheets of paper although it was only a study I still intended to use it not only to develop my understanding of colour relationships but to further develop my brush skills and painting on a small scale I decided, would help me to do that. I begun with a very light wash of green mixed with white followed by a very light wash of red. As the green was mixed with a lot of white and went on unevenly the red wash settled around it creating a prime coat of light red and green, which reminded me of rhubarb. Although the subjects I chose were mainly red and green there were other colours as well which were omitted by using only the complimentary colours these were, yellow, orange and light brown. For the grey details such as the bruising on the mangoes, the watermelon seeds and the dark stripes on the skin of the watermelon on the left of the plate I mixed the colours together and and allowed them to cancel each other out. 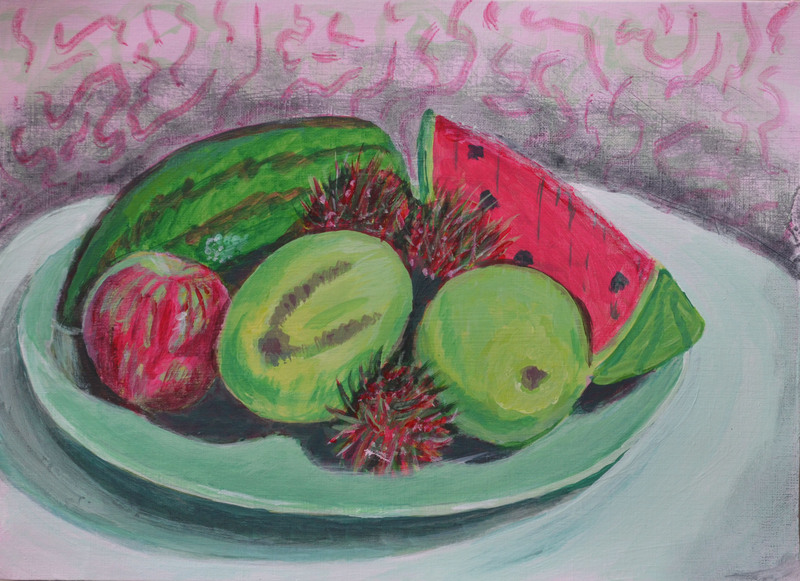 This was also a technique I used for the darker parts of the rambutan, painting wet red over wet green to get the darker strands. I also allowed the pigments to cancel each other out for the shadows although I made the result of this biased towards red in most places so that the green of the mango would really stand out. I find it hard to use my imagination when painting still lifes and to me there wasn’t really much I could do here to make this stand out all I know is that I was bored of using the same old round table with the plain backgrounds and so if I were try and get inventive wouldn’t this be the best place to start. I applied a light coat of white/red to the background with a scrumbling technique followed by fine drip like streaks then painted the shadows with a muddy green applied with the same scrumbling technique. It may not be genius but it makes the still life composition stand out,however it wouldn’t be until the next exercise Still Life with Colour used to Evoke Mood that the background would really come alive. This entry was posted in 3 Colour Relationships, 4 - Still Life with Complimentary Colours, Coursework, Pt 2 - Close to Home and tagged a painting with complimentary colours, Bachelor in painting, colour relationships, distance learning, oca painting 1, still life painting, Still Life with Complimentary Colours on June 9, 2015 by Mark A Smith. 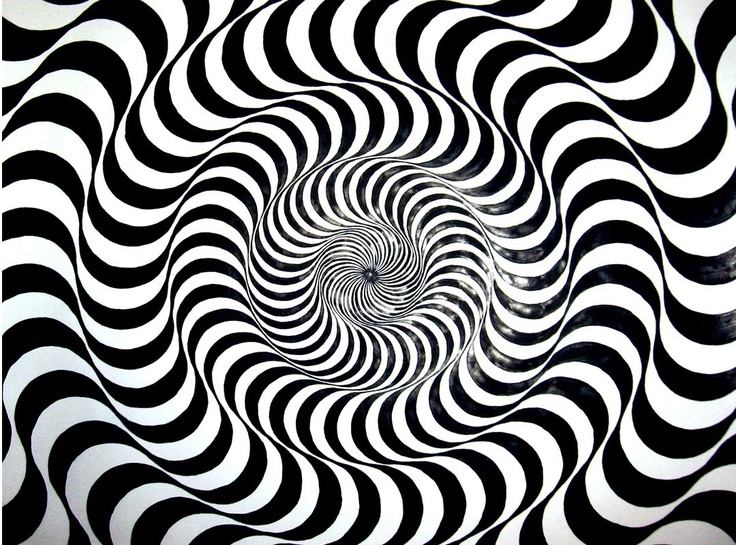 Optical effects have been exploited by many artists to create and depict effects of light. The impressionists, Post-Impressionists and Neo-Impressionists – in particular the Pointillists, Seurat and Signac – made full use of the new understanding of the nature of human perception. Find out what you can about these artists’ aims and study their pictures to see how they achieved effects such as optical mixing. Look at the work of Bridget Riley or the Op artists. Make notes in your learning log. I began by looking at the impressionists, with Claude Monet one of the best examples of artists who used optical effects to depict light. Looking through his paintings, most of which I knew from my time selling reproduction art but the one that made me stop to enlarge it was.A Woman with a Parasol 1975. The painting is of a Woman with a Parasol like in the painting I looked at in the earlier research point Chevreul’s Colour Theories, Poppies at Argenteuil, 1873. When I first looked at the painting I thought ‘wow he has painted the woman in some detail’ but when I enlarged it I could see that it wasn’t the case. Monet basically modeled the light by painting the sky first then with darker paint he depicted the folds of the woman’s dress, the blue of the sky still showing through portrays the light of the sky reflecting off the material of the dress above the folds. 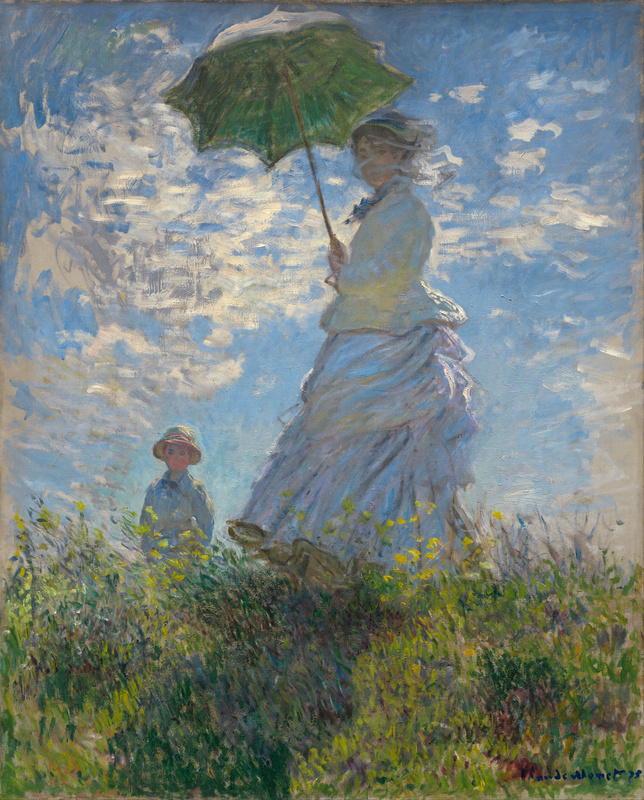 On the right hand side of the woman he uses white and other light colours to show light reflecting off her dress from behind helped by the shadow on the grass slightly to the left in front of her which he paints using darker hues and a greater use of blue than the rest of the grass. I particularly like the way he depicts the glow of the flowers by adding yellow under her arm. 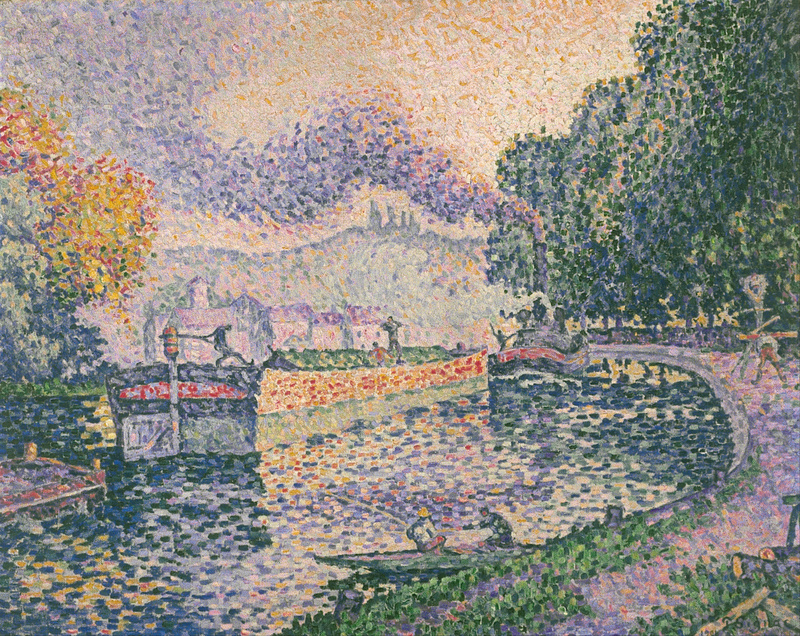 The Pointillism technique developed by Georges Seurat and Paul Signac uses small distinctly coloured dots that are applied in patterns to form an image. This technique relies on the ability of the viewer’s eye and mind to blend the colour spots into a larger range of tones on canvas as to more traditional methods of painting that blend pigments on the palette. After looking closely at a few paintings Seurat’s and Signac’s I began to examine two paintings that had familiar features, water, reflections and trees. The artists’ aims were clear in both paintings and in their own style using the same technique they both achieved them. Signac’s painting below seems to use larger clumsier dots to form the painting, this I noticed and most of his other works. Unlike his other paintings The Tugboat Canal in Samois below wasn’t saturated with blue. Although Signac’s placement of dots is quite crude compared to Seurat’s he carries of certain details in the painting very effectively. In the painting you can see how he has managed to depict the steam by using larger dots maybe pressing on harder to open up the brush, he uses darker hues at the bottom of the trail of steam this makes it look denser while the orange dots at the top of the steam makes it look like it is reflecting the evening sky, I say evening sky because of the orange glow and because the sun looks to be shining through the trees which means it would be low down. To paint the footpath he has used larger dots of a layer of small dots to illustrate how solid it is compared to the larger dots of the water. 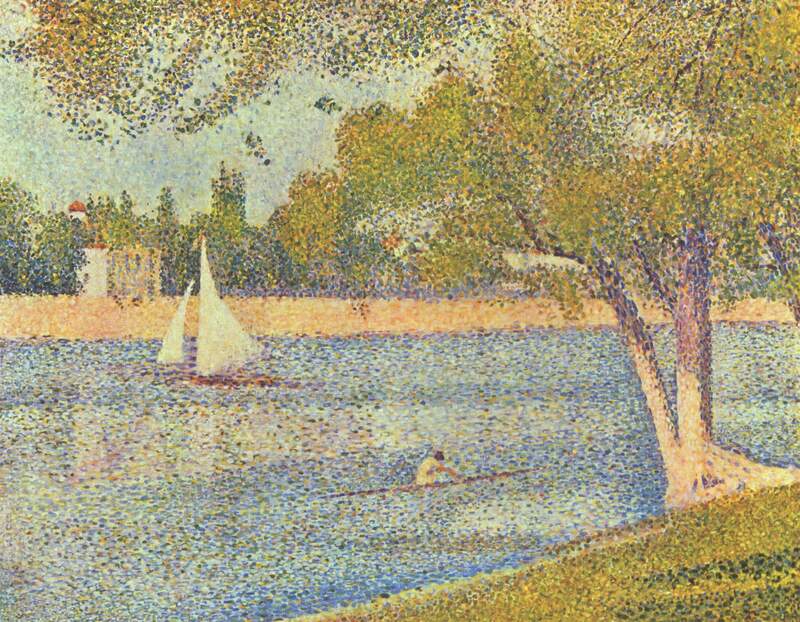 He depicts the reflection of the barge on the water by using similar colours to the boat but using white dots to distort the reflection, which is a very different approach to how Georges Seurat painted the water in The Seine and la Grande Jatte below. Here Seurat has painted the water by painting in lighter patches among a river of blue to depict either the break from the sail boat or the pull of the current in the water, either way it works well and he hasn’t had to paint a reflection of the boat in the water. In Signac’s paintings as I said earlier he saturates a lot of them with blue to depict shadow or an absence of light, In the painting below you can see that Seurat has done the same under the leaves of the tree in the foreground. Op art is the kind of art that makes my eyes bleed so I really had to look for works of Bridget Riley’s that weren’t too…effective. In Bridget Riley’s paintings she depicts irregular three dimensional surfaces as well as movement which she achieves by using warped lines or checks which are thinner or narrower in certain areas to create a sense of depth such as the painting above. In the painting above she adds a white reflection to the black lines on the right of the image this forces the viewer to see the curves differently from the left. I can only describe it as circles of waves or half tubes which you would walk over to get to the middle, however because of the added reflection it creates an optical illusion of the peak of the wave being up at one side and down at the other. I can only guess that her work is influenced by one of my favourite artists optical artists M. C. Escher. 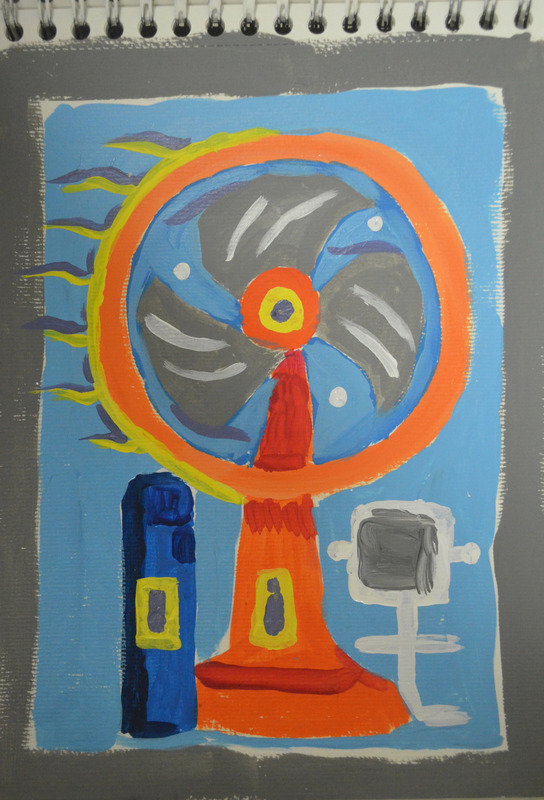 This entry was posted in 3 - Research Point - Optical effects, 3 Colour Relationships, Pt 2 - Close to Home on June 8, 2015 by Mark A Smith. This is something that we encounter a lot but we don’t think about how it happens. The first part of the brief tells us to find or paint a large area of bright colour, stare at it for 30 seconds and then close your eyes and wait for an after image to appear. Because I chose red the after image that appeared was the complimentary colour green. 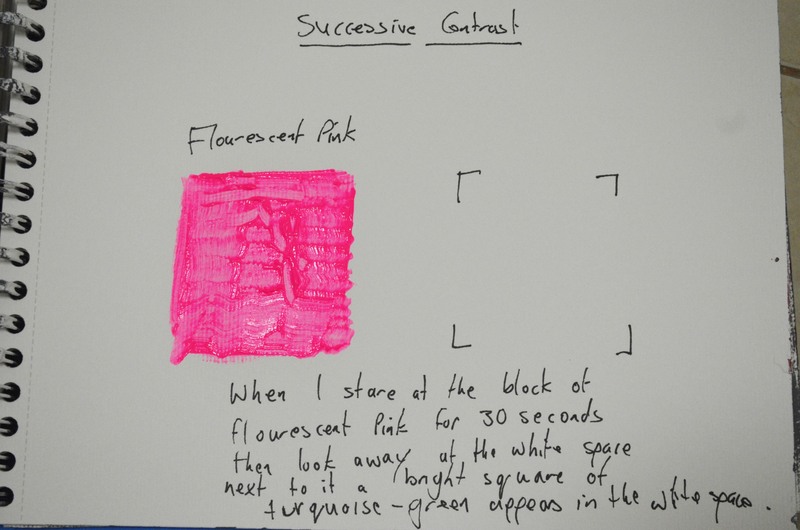 From there I painted an isolated square of my most vivid and intense pigment, which happened to be fluorescent pink, I did the same with this then after 30 seconds I shifted my gaze to a white space on the same paper, the after image that appeared was an intense turquoise, Its complimentary colour. These effects are caused by the stimulation and exhaustion of the receptors in the retina. By Exhausting the receptors for red, for example, only the remaining combinations of colours that mix to produce blue green are seen when you turn from looking at red to looking at white. White light, as Newton showed, is made up of all the colours of the spectrum. The human eye has full colour discrimination through the rod and cone cells. The rod cells in the Retina distinguish light and dark, while the three types of cone cells respond to red, green and violet which make up colours. 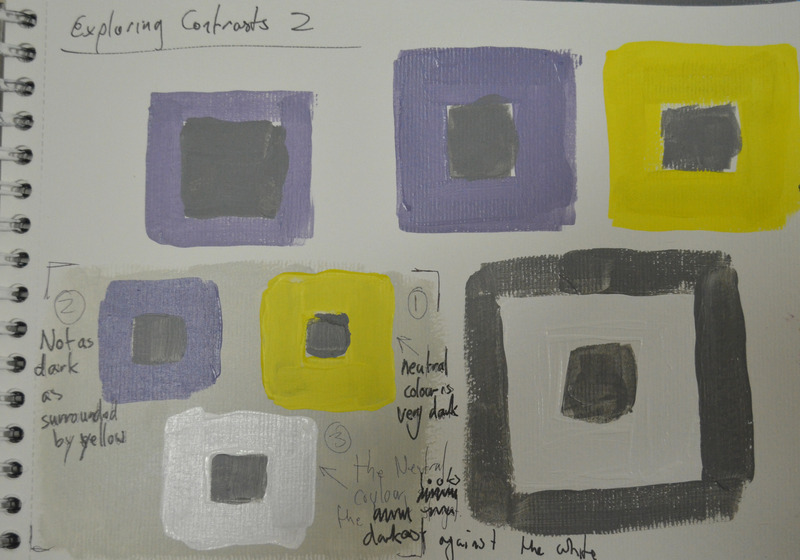 This entry was posted in 2 - Successive Contrast, 3 Colour Relationships, Pt 2 - Close to Home and tagged BA degree painting, Bachelor in painting, close to home, colour relationships, oca painting 1 course, successive contrast on June 4, 2015 by Mark A Smith.